Most brides-to-be search through hundreds of examples to find possible wedding bouquets. You can go through photo examples to find your ideal bouquet. Choose a wedding bouquet that matches your personality and adds a beautiful touch to your special day. Your choice could be as simple as a classic bouquet with elegant beads. Lilies are sophisticated and elegant. Calla lily bouquets are beautiful in any season, but especially spring. Look for colors that reflect your theme and season. For a more daring tropical touch, pick up stargazer lilies to add to your bouquet. Wilflowers make gorgeous summer wedding bouquets. Whether you go with a professional designed bouquet, a mix of wildflowers and exotic options, or some simple brightly colored options, a summer bouquet is one that should stand out against other vivid hues of the season. Berries are a beautiful accent for Christmas bridal bouquets. While berries can be added in any seasons, they look especially fitting in Christmas designs as an alternative to greenery and other fillers. Look for bright red berries that reflect the holiday season. A simple wedding bouquet is sleek and stylish. An elaborate dress may be overshadowed by a large or ornate bouquet, while a small, simple bouquet may be out of place for a more formal event. Multi-colored flowers look brillant against white bridal gowns and basic bridesmaid dresses. Bouquets might feature red, orange, purple, and yellow flowers that work together to create a gorgeous design. These eye-catching colors are perfect for island and summer weddings. White wedding flowers are effortlessly elegant. From roses to carnations to lilies to orchids to stephanotis, you have your choice of blooms. White flowers work in any season, with almost any theme, and you don't have to worry about matching any particular hue. Gerbera daisy bridal bouquets offer brides versatility due to the number of colors available. They can add casual touches to more formal designs as well as stand on their own. They look especially good at spring and fall weddings. Classic roses are always popular. While white and red are sophisticated, selecting another, such as pink, lends a feminine touch and romantic air to your bouquet. Have smaller posies for bridesmaids and a larger rose bouquet for the bride. Peonies are a large, classic flower that are a beautiful alternative to roses. Pair peonies with roses in a bouquet for a fresh look to a traditional round design. Select colors that complement each others, like shades of pastels, for a cohesive design. Hydrangea bouquets have a delicate, layered look. Select various colors of hydrangeas in one bouquet, or add filler and additional blooms, like teacup roses, to the bouquet. They are also optimal for garden weddings and vintage nuptials. Red is a classic color, and flowers that go with red bridesmaid dresses range from red roses to stargazer lilies to purple lilies. Both matching and complementary hues are good choices. Add other jewel tones to create a luxurious feel to your bouquet designs. Select a fall wedding bouquet that features muted browns, mustards, oranges, and reds of the season. Consider adding dried flowers and herbs to the bouquet as well. Accent with a few strands of wheat and tie with raffia or burlap to finish your seasonal design. Blue isn't a common color in flowers. However, it can make a bouquet stand out, even against similar hues of bridesmaid dresses, since it's so unexpected. Add a few other unique blooms to blue wedding flowers and they are sure to pop as you and your maids walk down the aisle. 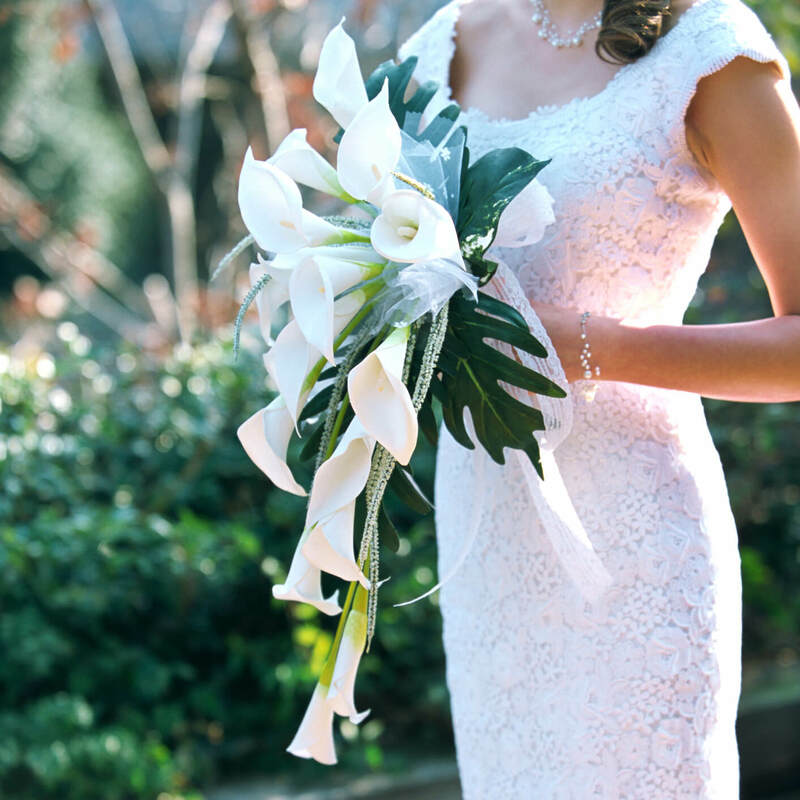 While many brides prefer to use silk or fresh flowers with greenery in their bouquets, contemporary options include a number of other unique options. Cotton, herbs, dried flowers, hay, and cattail have all been used in bouquets as alternatives to traditional greenery and baby's breath. Once you have a few ideas for your wedding bouquet, meet with a florist to make sure your choices are in your wedding flower budget.